With the introduction of the iPad, we were shown a glimpse of a post pc era, a term that is now being tossed around all the time since Steve Jobs said it. Does this mean that we'll all be using nothing but iPad, Android, and even Windows 8 tablets in the near future? I think it does look this way increasingly as Mark Zuckerberg recently said that more traffic is coming from mobile than the classic desktop, but that doesn't mean tablets and laptops and even desktops can't coexist. I own a Nexus 7 and a Galaxy Nexus. 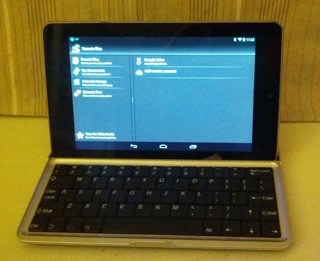 I decided to get a bluetooth keyboard for the Nexus 7 which doubles as a case, matching its size. Both fit in my back pocket snugly together. A picture of this setup is to the right. Could this be a laptop replacement? Not yet and most likely not for most people, however, the portability of it plays a huge role for me. Looking things up on it is more convenient and pleasant than using a phone especially if you plan to show someone else. It might end up replacing my laptop sooner than I thought.